In Software Engineering Software Configuration Management is the task of tracking and controlling changes in the software part of the larger disciplinary field of Configuration Management. The SCM practices include vision controls in the establishment of baselines. If something goes wrong, SCM can determine what was changed and who changed it. The goals of Software Configuration Management are generally Configuration, Identification, Configuration idioms and baselines, configuration control, implementing a control change process. This is usually achieved by setting up a change control board whose primary function is to approve or reject all change request that is sent against any baseline. Configuration status accounting, reporting and recording all the necessary information on the status of the development process. Enforcement: With enforcement feature executing daily ensures that the system is configured to the desired state. Cooperating Enablement: This feature helps to make the change configuration throughout the infrastructure with one change. Version Control Friendly: With this feature, the user can take their choice of version for their work. Enable Change Control Processes: As Software Configuration Management tools are version control and textual friendly we can make changes in code. Changes can be made as a merge request and send for review. => Contact us to suggest your listing here. Here is the list of the top paid and free open source SCM Software tools with the comparison. 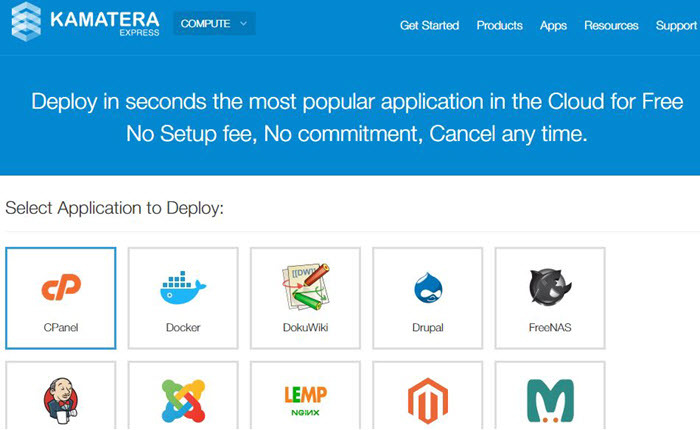 Kamatera is the best tool for Cloud Application Deployment. The best service provider to deploy the most popular applications on cloud infrastructure for free. CFEngine is a configuration management tool that provides automation configuration for huge computer systems, inclusive of the unified management of servers, systems, users, embedded networked devices, mobile devices, and systems. Users: Intel, AT&T, LinkedIn, Amazon, State Farm, SalesForce etc. Saving: 2.1 Million worth is saved. Documentation is very difficult to understand where to start the new installation. Not good with file integrity checkers. As open-source origins, CFEngine has a free open-source version available, but after 25 free nodes, the price is unspecified. Puppet is an open-source software configuration management tool. It is used for deploying, configuring and managing servers. It uses a master-slave architecture. Configurations are pulled from the master by the nodes. Price: Puppet Enterprise is free for up to 10 nodes. Standard pricing starts at $120 per node. Open source Version Community support completely free. Enterprise Version: Depends on size of enterprise. Users: JP Morgan Chase, OnxyPoint, CBSButler, Heart Land, AT&T, Smart School etc. Why should Puppet be chosen? Reporting and Compliance i.e. 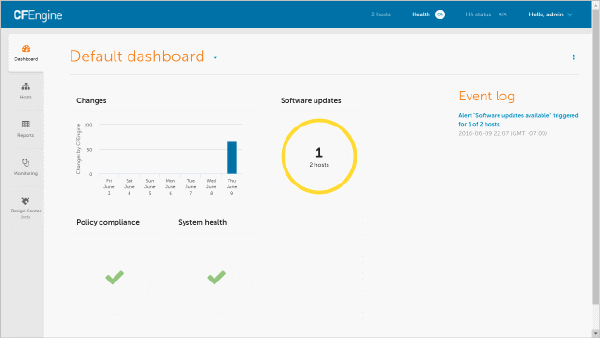 gain real-time visibility into the state of your infrastructure. Puppet has Strong compliance in automating and reporting tools. Puppet provides active community support across development tools. Puppet provides Intuitional web UI to handle multiple tasks, which includes reporting and real-time node management. Initial understanding could be tough for new users who should learn Puppet DSL or Ruby, as advanced and real-time tasks eventually require input from CLI. While installing Puppet process lacks adequate error messaging. Puppet support is more priories toward Puppet DSL over pure Ruby versions. Puppet Lacks revert system, so there is no immediate action on changes. The chef is basically an automation platform that provides a way to configure and manage infrastructure. Infrastructure as code implies executing by coding rather than doing manual execution. The chef works on Ruby and DSL for writing the configurations. On-Premise: Per model costing $6 per month– the same as Hosted Chef. Standard support is an additional $3 per month, and the premium version is $3.75 per month. Employees: Approximately 500 employees working currently. Users: Bloom Berg, BONOBOS, Facebook, GE, Hewlett Packard, Microsoft, Yahoo, Target, Voxel etc. As we all know Chef supports multiple platforms like Microsoft Windows and Ubuntu. Some client platforms like Debian and Fedora etc. Chef also provides active, smart and fastest growing community support. Chef follows the Push model and allows cloud adoption. Chef helps to increase service resiliency, to develop more defect-free software as it captures bugs before they occur. Chef Helps to improve risk management. Chef’s automation abilities are able to lower risk and improve compliance at all stages of development. The chef doesn’t support the push functionality. Ansible is the best configuration management, deployment, orchestration open source tool and also automation engine. It is a push-based configuration tool. It helps to automate the entire IT infrastructure by providing large productivity gains. Ansible generally connects through SSH, remote PowerShell or via other remote APIs. Basic Tower: $5000 per year up to 100 nodes. Enterprise Tower: $10,000 per year up to 100 nodes. Premium Tower: $14000 per year up to 100 nodes. Employees: Around 300 employees working currently. Users: Atlassian, allegiant, Cisco, Gartner, NASA, twitter, Verizon, NEC, porter etc. Agentless means no need for agent installation and management. Uses SSH for secure connections. Follows push-based architecture for sending configurations so that user can control the changes made on servers. Ansible can be idempotent if written carefully. Ansible is based on SSH, so it doesn’t require to install any agents on remote nodes. Ansible playbook structure is easy and crystal clear structured. Ansible has a more streamlined code base compared to some other tools. Ansible is less effective than other tools which are based in other programming languages. Ansible introspection is really very poor, so it makes tough to see the values of variables within the playbooks. SaltStack is also a configuration tool that works on a master-client setup model or a non-centralized model. SaltStack is based on Python programming language, SaltStack provides a push and SSH methods to communicate with clients. 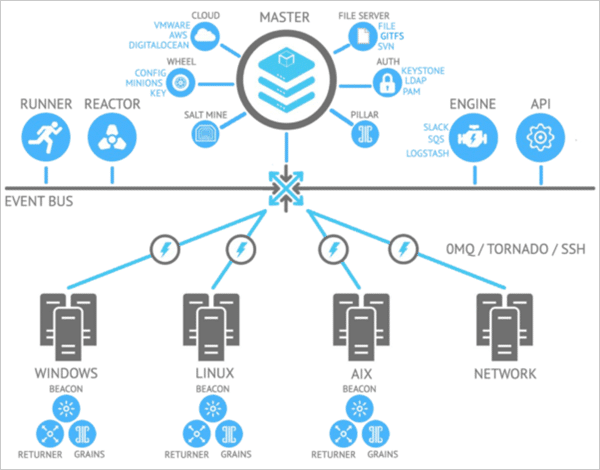 SaltStack allows to group together clients and configuration templates to take control of the environment simple and easy. Price: It starts at $5,000/year excluding support; subsequent tiers run up to $14,000/year and include 8×5 or 24/7 support. However, it is based on research as the original price is not mentioned on the official site also. Employees: Approximately 200 employees working currently. Users: JobSpring Partners, DISH Network Corporation, Everbridge Inc, Cloudflare Inc, Ubisoft S.A.
Salt Cloud integrates with many other cloud providers like Google Cloud, AWS, etc. so it’s easy to take benefit of all the assets with one command. Saltstack has minions which can check files, processes also host other things. With orchestrate in bucket Saltstack deploy a complex application by executing single line commands. It is simple, Straight and usage is easy once you go through the setup phase. Saltstack has DSL feature so it doesn’t require logic and states. Saltstack's Input, output, and configs are very stable and consistent because it uses the concept of YAML. Introspection feature plays a handy role as it makes simple to look at what is happening inside Salt. The first installation process is really difficult to set up and make tough to for new users to understand. Support for non-Linux Oss is not that great. Juju is one of the famous configuration management tools which is open source and is created by Canonical Ltd.
Juju mainly emphasizes on decreasing the operational overhead of new generation software by providing facilities like quick deployment, configuring, scaling, integration, and doing operational tasks on a huge range of public and private cloud services along with only servers, open stacks and local system based deployments. Price: It starts at $4,000/year excluding support; subsequent tiers run up to $12,000/year and include 24/7 support. However, it is based on research as the original price is not mentioned on the official site also. Users: AMD, Cisco, Dell, HP, IBM, Intel, Lenovo etc. JUJU provides software provisioning capabilities. JUJU provides instant integration and scaling. JUJU can resolve almost all complexities regarding service scaling by using charm. JUJU can be used to run multiple PaaS on a platform. JUJU has a small footprint (2 nodes) K8s cluster deployment. JUJU has a multinode deployment. Dashboard, Ingress controller, and DNS. JUJU provides TLS between nodes for security. JUJU can scale up and down nodes. JUJU provides no clear instructions on using OpenStack cloud provider and using cylinder or LbaaS. JUJU provides no support for advanced networking such as Calico. JUJU has no possibility to provide provision open Stack Nodes for K8s cluster. The rudder is one of the famous and most used open source, web driven, role-based solution, configuration and audit management tool to make automated system configuration across huge IT organizations and compliance. Rudder depends on a light local agent which are installed on each and every managed system. Rudder’s server-side web interface is built by Scala language and its local agent is written in C language. Price: It starts at $4,000/year excluding support; subsequent tiers run up to $10,000/year and include 8×5 or 24/7 support. However, it is based on research as the original price is not mentioned on the official site also. Rudder Tool provides Web Interface to manage the nodes and also define policies. Rudder hosts the inventory part. Rudder provides custom policy editor which is very unique. Rudder automates the simple tasks of administration like installing or configuring. Rudder supports FULL REST API to communicate with Rudder Server. The rudder has GIT in its backend. Rudder dynamically generates each host policy. Rudder community is growing but not very big on this day like the puppet, Ansible etc. Rudder is overkill if the goal is only to push one-time actions. 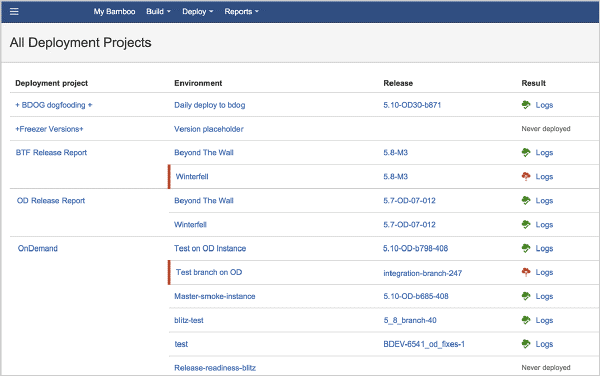 Bamboo is one of the Atlassian's continuous delivery and releases management tool. Bamboo offers a high standard of support for regular delivery. Bamboo gives output as a single flow. Bamboo provides developers, testers, build engineers, and system administrators a common shared space to work and share information storing sensitive operations like production deployment and security. Bamboo is basically a tech-stack as it is suitable for any language and other big technologies like AWS, Docker etc. Bamboo provides justice to the deployment of projects and environments. Bamboo provides dedicate agents feature, with the help of which user can run hotfixes and critical builds right away and there is no need to wait for it. With the use of Bamboo gives better and improved CI/CD. Bamboo can hook with SVN and in this manner, provides full SCM support. Bamboo has no scope for inheriting project structure, as a result, it becomes a tough task to define behavior for each and every module. Poor Documentation for installation and tough for the new user to understand. Bamboo doesn’t support the passing of properties. Bamboo doesn’t support the concept of build promotion. TeamCity is also one of the management and continuous integration server developed by Jet Brains and based on Java Programming Language. Released on 2nd October, TeamCity provides up to 100 build configurations (jobs) and run unlimited builds. Concurrently it runs 3 agents and if needed it to add extra also. It possesses a public bug tracker and forum open to all the users. It's open source so free for all users. Employees: Currently 720 employees are working and increasing even more. Users: Acquia, Google, Heroku, Microsoft, Pivotal, Redhat, spring, Typesafe, Oracle. TeamCity has a configuration feature which avoids code duplication. TeamCity version control system is comprehensive. TeamCity provides support for integrations. TeamCity helps you with multiple ways of interaction, customization, and extending your server. Cloud integration functionality is also supported. TeamCity is a feature-rich toolset. TeamCity has many developer-oriented features. TeamCity doesn’t require any additional plugins. There are more than 100 features in TeamCity. TeamCity allows you to grow and move smoothly. TeamCity restricts you in term of different kinds of projects according to its base plan especially build configurations. It may take time for a new user to get acquainted with the project hierarchy structure of it. Below are few TeamCity tool Images for reference. Octopus is one of the famous configuration tools which takes you beyond the limit where your Continuous Integration server ends. Octopus Deploy helps you enable automation even for the most complex application deployments, whether the application is on-premises or in the cloud, it will not be an issue. Cloud Data Center: Depends on criticality. Octopus provides fast, repeatable and reliable deployments. Octopus can promote release between environments. Through Octopus Deploy complicated deployments are made easy. Intuitive and simple so easy to use its user interface. Octopus provides world-class platform support like ASP.NET, JAVA, Node.Js, many scripting languages, databases, and other platforms. Octopus Deploy is developed to possess a very powerful and flexible deployment process. Gives users massive permission when comes to granularity. 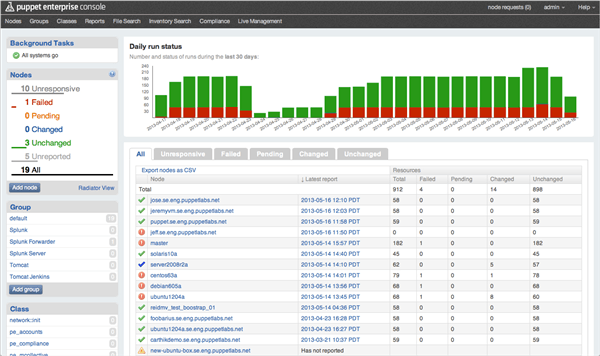 Provides a good and managed audit sections for deployments. Application and database deployments are really executed in smile manner through the life cycle. For new users, the tool can be confusing as it has so many options. As multiple environments can be accessed the UI gets ramped up. Can be improved on with AWS integration. Sometimes it gets difficult to understand the code repo. Octopus has to manually installed on each hosted machine which is very time taking and boring task, something should be done about it. As there are many Configuration Management SCM Tools, it’s quite important to research and select the best tool which would be good for your organization. I hope this article will help you with that. Small -Scale or Mid-Level Organization: As these type of organization look for the open source and more effective tool which can be beneficial for their organization as they have less strength of employees and finance. So for those CFEngine, CHEF, Rudder and Bamboo configuration tools would be a good choice as they are open source, highly scalable and robust and secure. They are being used by many giant companies also. Maintenance and set up is easy. They are based on most used programming languages like Java and .net. They support cross-functionality and multiple OS platforms. These tools support cloud adoption as well as 24*7 support. Large Scale Industries: These companies mainly focus on robustness, availability, security, and support. So most of the giant companies prefer CFEngine, Ansible, CHEF enterprise version, Octopus, TeamCity etc. These tools provide reliable deployment process and support multiple OS platforms. They are open source as well as if the company want the extended benefits they can opt for the enterprise version. These tools possess multiple features, granularity and orchestration, Idempotent, interoperability and a minimal learning curve is required. => Contact us to suggest a good listing here.